2017 Honda Civic prototype review | What Car? For the last three years, Honda has been busying itself with the biggest model replacement project in its history. Three times as many designers and engineers have worked on it than are normally allocated to a new hatchback, saloon or SUV. It wasn’t the project you might imagine: to bring the new NSX hybrid supercar to market. That was a shoestring production in comparison, which just happened to be going on at the same time. No, it was the one that’s brought us this 10th-generation Honda Civic. Why is it such a big deal? Because this time around the British-made Civic hatchback is a global car being built on an all-new platform that's shared with its American-built saloon and coupé sister cars. It’s bigger than before and, according to Honda’s sales pitch, also classier, more economical, better-performing and crisper-handling. Two-out-of-three of the engines that will power the car, when it goes on sale in March, are brand new, too. 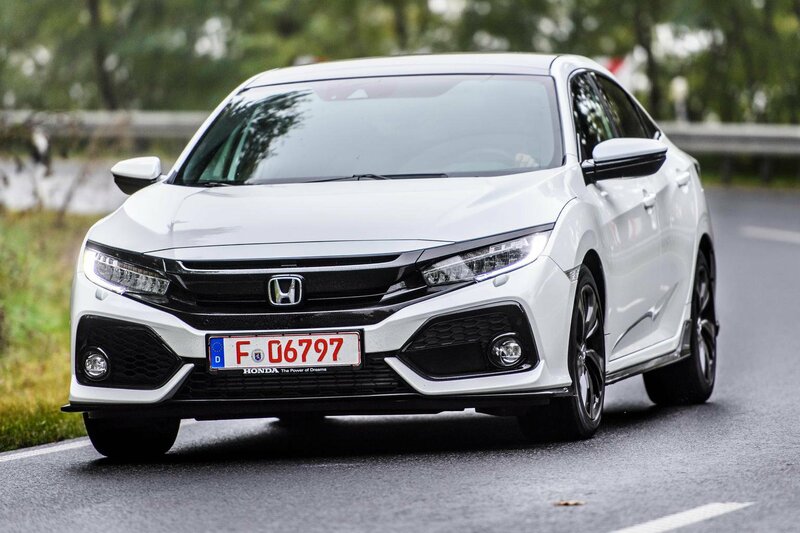 In fact, the only important part carried over from the old Civic to the new one is Honda’s 1.6-litre i-DTEC diesel engine, which will join the range a few months after the 1.0- and 1.5-litre turbo petrols with which the car will be launched. What's the 2017 Honda Civic Sport like to drive? 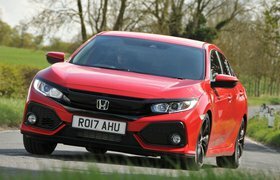 Despite the edgy, challenging styling of the last couple of Civic generations, the model has carved out a reputation for sensible reliability, unadorned quality, outstanding practicality and convenience. So, although Honda will tell you it’s playing to a younger and more aspirational audience with this car than with any before, it’s certainly not throwing the baby out with the bathwater. Even in Sport trim, the Civic is a refined, compliant and laid-back hatchback that doesn’t impose itself much on your senses. That new 1.5-litre turbo engine is quiet at middling revs, but nicely potent with it, bringing a modern-feeling torquey power delivery to the petrol side of the Civic model range for the first time. 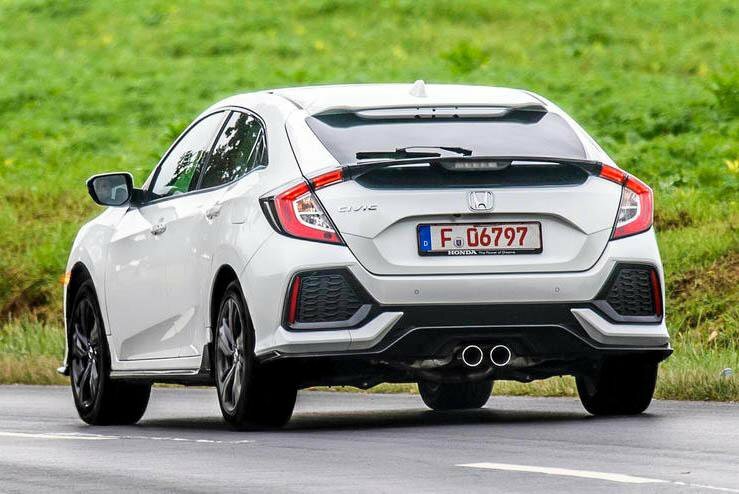 Other similar-sized turbo engines might feel stronger in outright terms, but the Civic’s is smooth and predictable up to the higher reaches of the rev range, when it begins to get breathless and strained. Honda has switched from a torsion beam rear axle to a more sophisticated multi-link set-up and made the Civic’s body some 50% more rigid. These changes mean the car now needs less unyielding suspension settings to handle in a poised and precise fashion – and it shows. Mid-corner bumps no longer knock the car off-line like they used to, and it’s easy to keep the new Civic positioned exactly as you intend on the road. It's helped by the fact it steers with an expertly tuned blend of directness and control weight, always grips securely and keeps fine control of its body movements. What's the 2017 Honda Civic Sport like inside? The major change here concerns what’s under the driver’s seat, or, more specifically, what isn’t. In the last two Civic hatchbacks, Honda placed the fuel tank there, making it possible to fit 'magic' rear seats which could be folded up like cinema seats. However, now the company has reverted to a conventional position for the tank just ahead of the rear wheels. This has allowed the driver’s seat to be mounted lower down, resulting in a less perched-up driving position. However, it also denies new Civic owners the opportunity to easily carry bulky items on the rear cabin floor. Head room up front is now much improved, of course, while the sheer size of the car ensures that both rear space and boot space are first-rate. Honda won’t offer a normal parcel shelf with the car, it says, because markets other than ours don’t demand them – but there is a sliding cover for the load bay area to keep its contents out of sight from prying eyes. Honda also says it benchmarked the Audi A3 as its target for the Civic on material quality: a claim that the Civic’s interior doesn’t bear out. The car has an inconsistent mix of both soft-touch and harder mouldings, and decorative trims that only seldom lift its ambience above dark, dull and plasticky. There’s nothing wrong with the robustness or substance of what you can see and touch, but the skill with which the better European car makers conjure that abiding sense of perceived quality is notable by its absence. Upper trim levels of the new Civic will come with a new Honda Connect 7.0in touchscreen infotainment system that adds smartphone mirroring for both Apple and Android phones to the car’s connectivity options. Unfortunately, it’s still a relatively unresponsive and unintuitive system that’s tricky to navigate at times, and that’s still saddled with Garmin navigation that doesn’t really belong in a premium-priced car.